Traditionally, there were from 350 to 400 cheeses made in France, but there are now over 1,000 varieties. 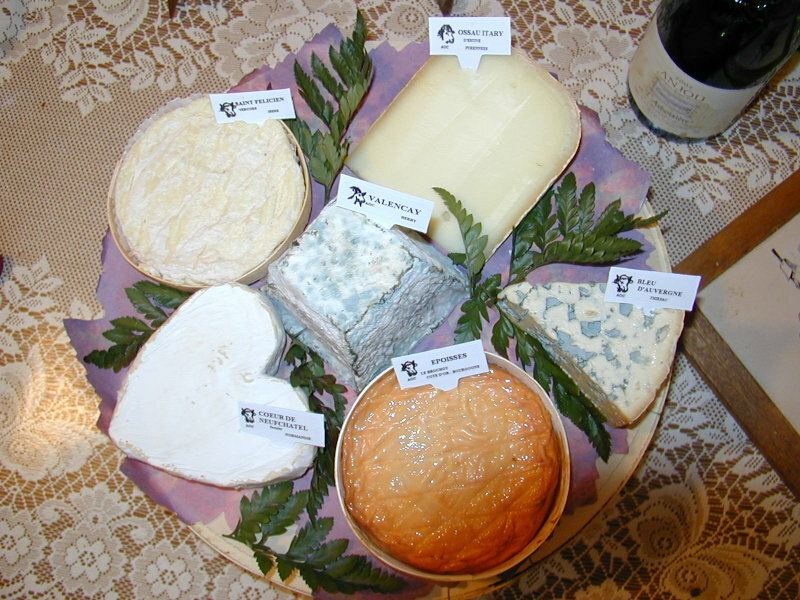 Left: Six cheeses from France: Valençay, Ossau Iraty, Bleu d'Auvergne, Époisses, Cœur de Neuchatel, Saint-félicien. 1. Camembert is a soft, ripened cheese made from unpasteurized cow’s milk. It originated in Normandy, coming from the Pays d’Auge, the historic name for the region and time period it came from. Real Camembert de Normandie must have the VCN stamp of approval on the label. Camembert has a slight salty taste with a sweet tang. 2. Brie de Meaux comes from the Ile-de-France region. It is made with both pasteurized and unpasteurized cows milk. This cheese comes in small platter sized disks and is wrapped in wax paper and put inside a wooden box to keep it at the perfect ripeness and freshness. Has a mushroom like aroma and a nutty garlic flavoring. 3. Roquefort is a type of blue cheese. It is made from unpasteurized sheep’s milk, and has a soft, edible rind. This cheese is similar to a French Bleu des Causses and Bleu d’Auvergne because of its subtle flavor and salty rind. 4. Boursin is a triple-créme cow’s milk type of Brie, coming from the Ile-de-France region. It is sold in pasteurized and unpasteurized forms. This cheese has a 75% fat content, similar to all triple-créme cheeses. Boursin is smooth, and has a nutty flavor. It is rich and creamy. 5. Reblochon is made in the Savoie and Haute-Savoie regions of France. It is an unpasteurized cheese with a soft texture similar to Brie. Has a sweet beefy flavor. 6. Munster is from the Alsace region of France. This cheese has a dry, firm, inedible rind when young, and is dark and smooth when ripe. The cheese is soft and creamy, and has a beefy favor. 7. Pont l'Evèque originated from the Pays d’Auge in Normandy. This cheese comes in eight to thirteen ounce, boxed squares, and has a 50% fat content. It is sold both pasteurized and unpasteurized. It is similar to Camembert, with a more intense flavor. 8. Époisses comes from Burgundy, France. This cheese has a rustic smell. It has a reddish brown rind, and a vibrant flavor. The cheese is packaged in small wooden boxes. 9. Chèvre is a soft, mild, goat cheese. It is molded in cylinders, so has a round tube-like shape. It has a sharp and tangy flavor when aged a long period. 10. Tomme de Savoie originated in Savoie, France. It is a pasteurized and unpasteurized cow’s milk cheese. It is semi-pressed, because it is made from pressed curds. The rind is natural yet inedible. This cheese has a very low 20% to 40% fat content. There is a noticeable fuzz on the outside rind, and has mild yet savory flavor and aroma.